WOKING FC Chairman Mike Smith has given his unreserved backing to National League officials after they became the latest high-profile organisation to put their name to the Armed Forces Corporate Covenant. Coinciding with this year’s Remembrance Week, Chairman Brian Barwick and officials of The National League – who are the association in charge of the 68 clubs across the national game’s fifth tier, at which Woking play, and the regional sixth tier – have announced the historic sign-up which acts as a promise between its signatories and acting or former service personnel to treat them with ‘fairness and respect in the society they serve with their lives’. Drafted in June 2013, to date the document has the public support of over 700 companies. The iconic backdrop for this latest signing will be Horse Guards Parade and will follow the monthly November meeting of the Board of The National League, at which Chairman Barwick will sign on behalf of his colleagues. To further recognise the close link between The Army and the game of football, two players from neighbours Aldershot Town – the first club to sign the Corporate Covenant in May 2014 – will be present at the signing alongside the actual football from the First World War, known as the Loos Football, which claims a significant connection at the Battle of Loos in September 1915. An award-winning community club in their own right, Woking Chairman Mr Smith says that he and everyone at Kingfield are proud to add their name to the initiative, which pledges that ‘no member of the Armed Forces community should face disadvantage at work or in the community compared to other citizens’ and that ‘in some circumstances special consideration is appropriate for those who have given most, such as the injured or bereaved’. “Woking Football Club is right behind the signing that The National League is embarking on and we’re very keen to get involved,” said Mr Smith. Looking ahead Mr Smith added that this landmark event, which will further support the work which ‘encourages local communities to support the Armed Forces community in their area’ could just be the jumping off point for the club. “We would like to get to a stage, from a business perspective, where we are perhaps able to offer employment and training opportunities to military personnel in the community, and social interaction going the other way, in the future. And it’s not a one-way street, the military are looking to work closely with communities because they do provide an opportunity for employment and retraining after service, but also we have military personnel living within our communities and they need to feel part of that. Meanwhile, Woking and their fellow Non-League clubs have also been raising much-needed funds and awareness of the annual Poppy Appeal. 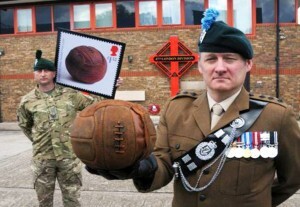 All 68 National League clubs have been working in unison with their local branch of The Royal British Legion to oversee collections, which are to be supplemented through a unique partnership, whereby a specially produced ‘captain’s armband’ (inset below) will be worn by each respective club skipper at all matches to be played in the National League on Saturday (November 14). League Chairman Mr Barwick has said he hopes that an additional £10,000 can be raised to supplement those amounts raised via ground collections and other local arrangements around Remembrance Day. Each armband is set to be made available for auction. Look out for Woking skipper Mark Ricketts donning the band when the Cards host Macclesfield at Kingfield this Saturday.